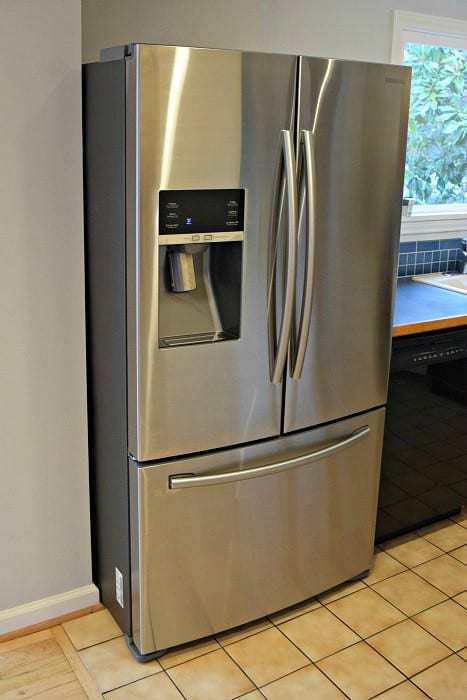 You can find used kitchen cabinets from salvage yards or craigslist ads for a fraction of the price of new. 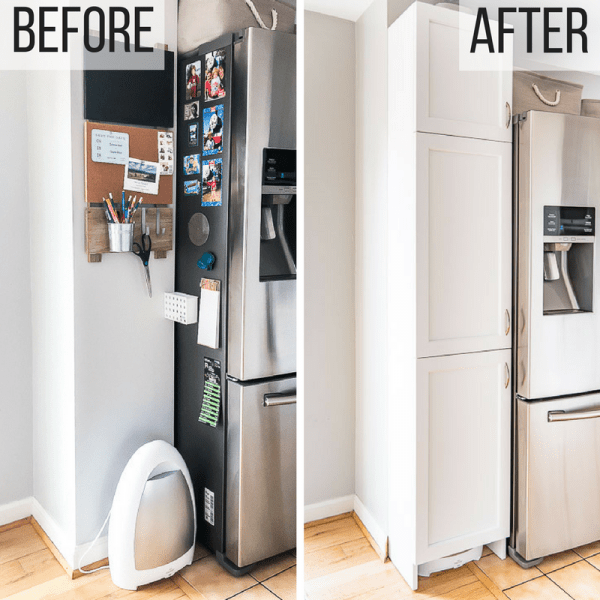 See how I transformed mine to fit the new space! Want to update your kitchen on a budget? Architectural salvage to the rescue! 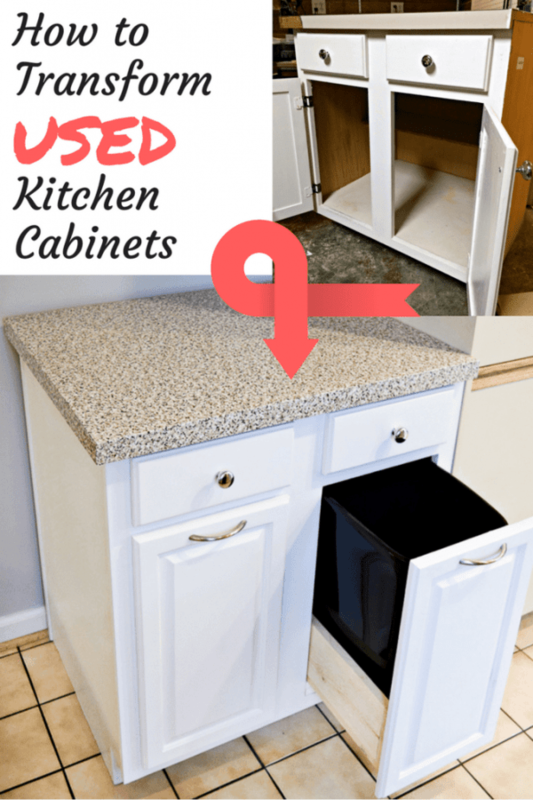 You can find used kitchen cabinets for a fraction of the price of new, and all it takes is a little elbow grease to give them a second life. and moved a new fridge into the old door space. The small space to the left of the fridge was filled with a pantry cabinet I built myself! This left us with a huge gap where the fridge once stood. We desperately need more counter space, and that space was perfect for another lower cabinet. But I wanted something that was cheap enough to demo without guilt when we finally renovate. I scoured my local salvage yards for used kitchen cabinets that would fit in the space. This one looked like a total piece of junk, with chipped pink Formica, drawers that barely moved, and stained contact paper lining. 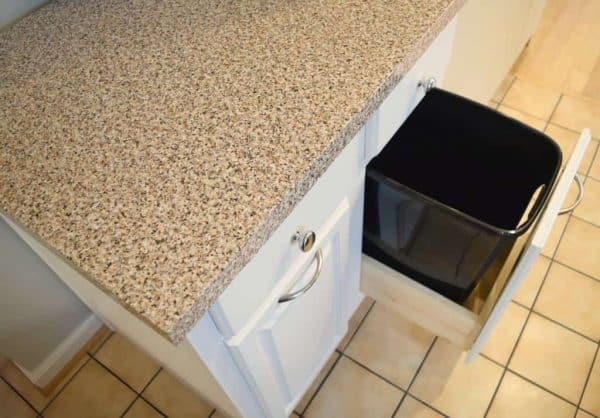 But the size was perfect for the space, and it still had the countertop attached. It even had a finished panel on the left side, which is exactly what we needed. I was excited to turn this sad, damaged piece into a concealed garbage and recycling center. 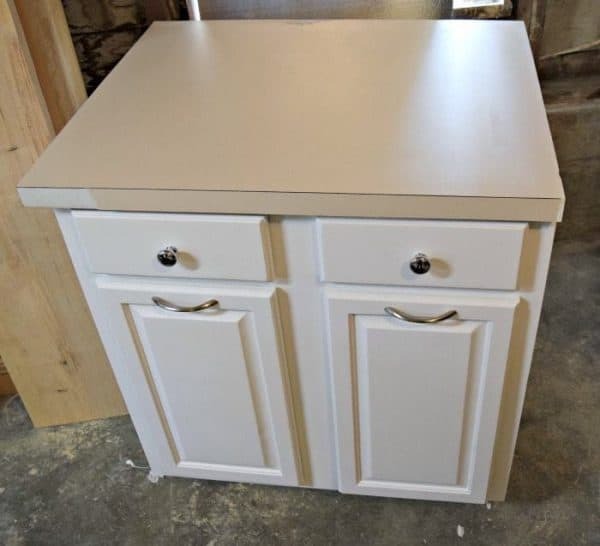 We could hide those ugly plastic trash cans, add an additional work surface and get two bonus drawers all in one piece! Trust me on this one! I’ve had a contact paper kitchen counter for over two years, and it fools people all the time! I started by removing the doors and drawers, and giving them a good sanding. Someone had painted this cabinet before, and not very well. I had to take it down to almost bare wood in some places in order to get rid blobs of paint and thick brush strokes. I was converting the cabinet doors into pull outs, so I filled the hinge and knob holes with wood filler, then sanded it smooth. There was a shelf in the back of the cabinet that needed to be removed. Nothing a few whacks of a mallet can’t fix! Most of the gross contact paper on the bottom peeled up easily, and left the wood underneath nice and clean. On the finished side of the cabinet, there was a bit of damage from when they removed the cabinet from its previous home. I covered it with flat trim that mimicked the look of the front frame edge and caulked the seam. I purchased new center mount drawer glides to replace the old, stuck ones. Instead of a track on either side of the drawer, the center mount system has just one rail down the center. 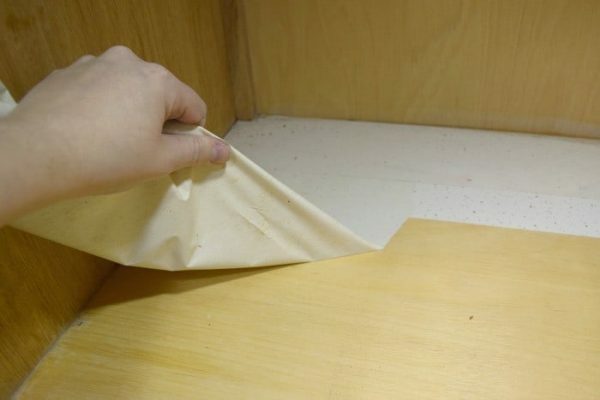 The drawer is super simple to remove for cleaning and was easy to install. 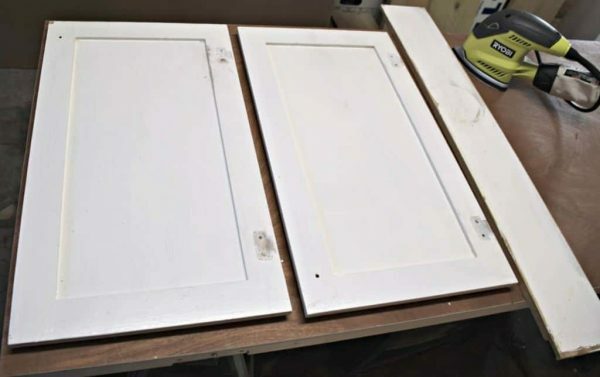 The entire cabinet got a few coats of white paint. 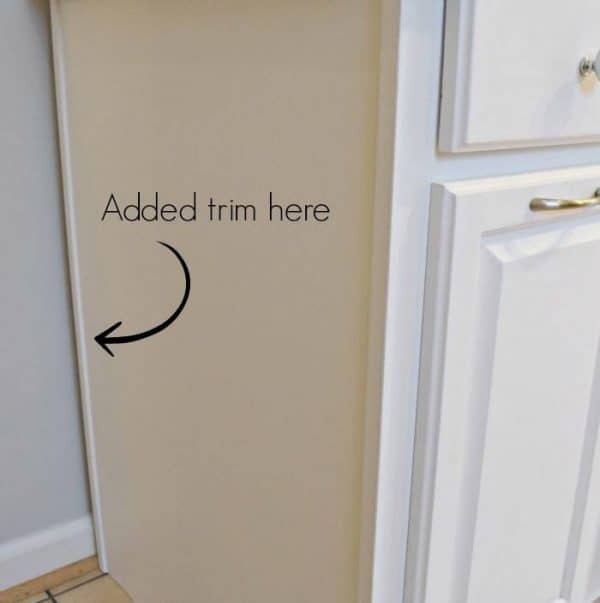 New hardware was added to the top of the cabinet doors to make it easy to pull out the garbage cans. 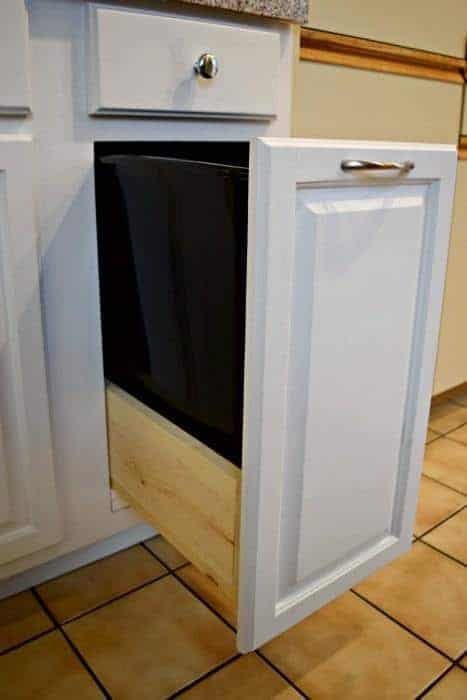 You can see my tutorial for how to make a pull out trash can cabinet here. Once the bottom of the cabinet was complete, it was time to tackle the countertop. It was in pretty rough shape, with chunks of Formica missing. I applied some spackle to smooth out those areas. 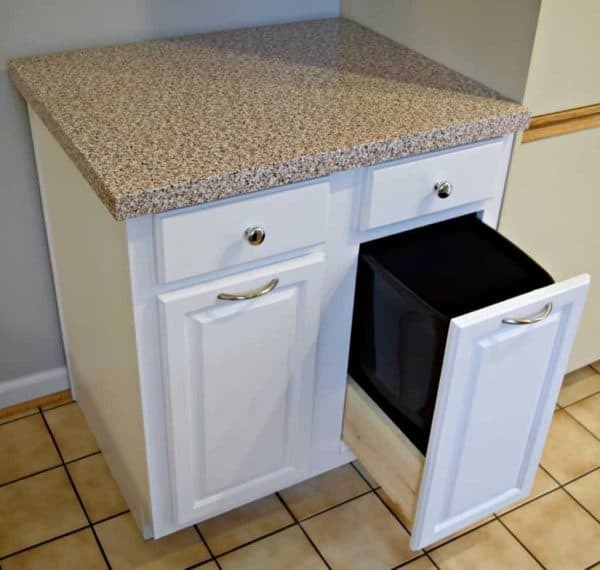 I thought about tiling the countertop, but that seemed like far too much effort and cost for temporary, used kitchen cabinets. Renters sometimes use contact paper to cover up ugly countertops, so I figured it was worth a shot. 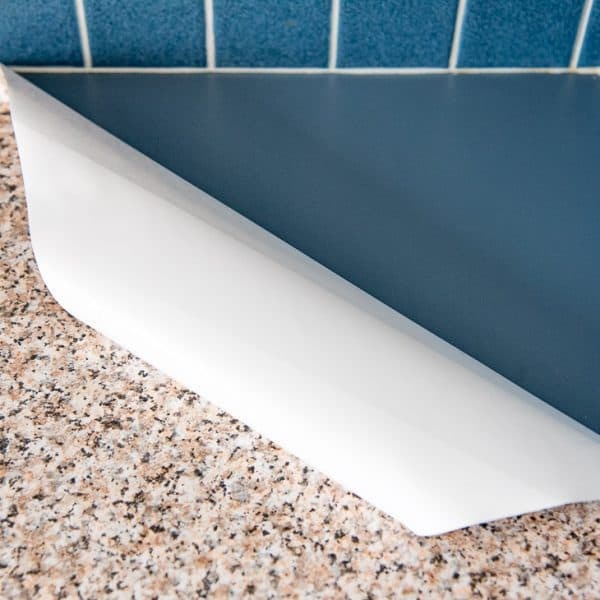 This granite contact paper goes well with our existing floor tile, but you can find plenty of other options to suit any kitchen. I was really impressed with how easy the DC-Fix adhesive film was to work with. It’s thicker than regular contact paper, which makes it much more durable. I didn’t have any problems re-positioning it or getting air bubbles underneath. 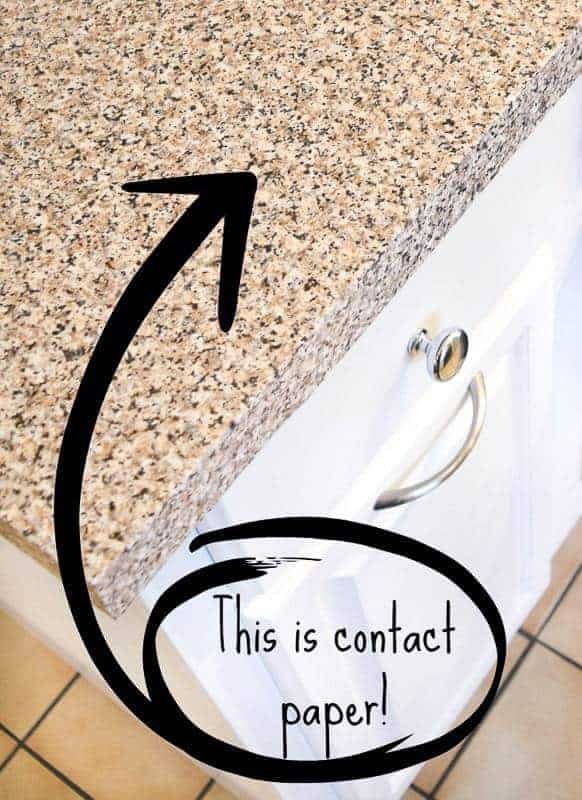 And because it’s waterproof, you can wipe down your counters like you would with any other countertop! If you have any doubts, check out how my contact paper kitchen counter looks two years later! The contact paper isn’t wide enough to cover the entire cabinet in one piece. I applied the front piece of contact paper first, wrapping it around the front edge tightly. Then I applied a second length of contact paper in the back, overlapping slightly. With the granite pattern, it’s difficult to see the seam at all! 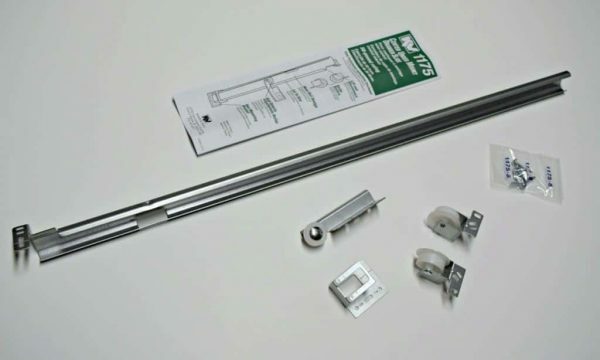 If having a seam bothers you, you can also buy these rolls that are 36″ wide, which is more than enough for your standard depth cabinets. I allowed for a bit of overhang when I wrapped the edges of the countertop to trim off later. At the corners, I stuck the contact paper to itself to form a triangle. Then I cut it straight down following the outer corner of the countertop. A small piece of leftover contact paper covered up the seam. With the new/used kitchen cabinet in place, the space instantly feels more functional! The rest of the kitchen is hideous 80’s melamine cabinets with wooden grab bars and blue laminate countertops. I painted those ugly cabinets white, and applied more granite contact paper to cover up the blue. 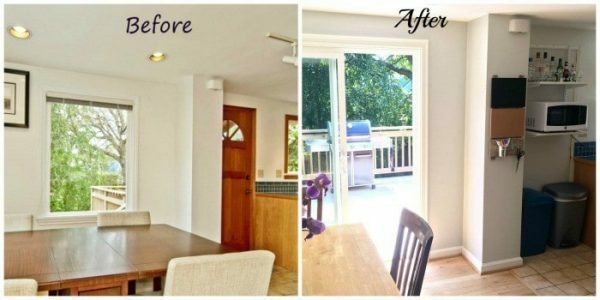 It completely transformed the entire room, and makes the wait before the full renovation begins much more tolerable! If you would like to keep up to date with my latest posts about woodworking, home improvement, and more, you can follow me on Facebook, Pinterest, or sign up for my free weekly newsletter below. That cabinet is transformed. Nobody would believe how beaten up it used to be. The pull out garbage turned out to be a fairly easy DIY project. I couldn’t believe the price of the store-bought kits! I’ll be posting the tutorial for mine in a couple days. Thanks for the sweet comment, Susie! Wow, it’s amazing how much upgrading the cabinetry in you’re home can change the whole look and field of a room. Thanks for sharing. This is so awesome! We would love for you to come link up for Wall to Wall DIY Wednesday over at R&R at home! 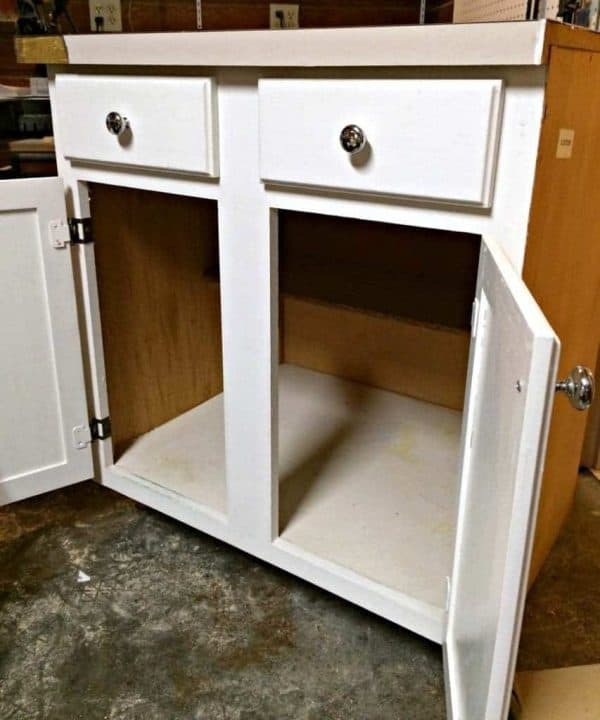 What a clever and wonderful use of old cabinets! Thanks for sharing with SYC.